As a TIGed Professional Development Instructor, I teach the Education for Environmental Stewardship e-course. Prior to this role, I managed the Tread Lightly program, working with educators all over the world to promote climate change education and encourage youth to become responsible global citizens. In other roles at TIG, I coordinate traveling exhibits for the Defining Moments art program and work on Commit2Act, a mobile app that allows youth to make environmentally-friendly commitments. I've spent the last ten years working on environmental and arts-based community projects around the world. Along the way, I earned an undergraduate degree in Environmental Studies and Biology from the University of British Columbia in Vancouver, and a Master's degree in Art Education from Concordia University in Montreal. As my thesis project, I explored the power of photography to elicit youth voice through PhotoLit, a photography and creative writing workshop that I created and facilitated with a group of inner-city youth in Toronto. My teaching practice focuses on experiential education and critical pedagogy, encouraging my students to think critically and express themselves creatively. 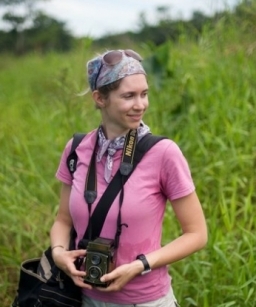 I've had some diverse jobs over the years, from a fundraising internship with The Nature Conservancy, to teaching middle school science on a rural island in the Bahamas, and facilitating art projects with marginalized children in Haiti and Romania.